Working collaboratively, Shana McCaw and Brent Budsberg of Milwaukee create miniature architectural forms-houses, telephone poles, farm buildings-and insert them into unexpected contexts, like the back of a sofa or the middle of a gallery wall. The effect is disorienting and unsettling. Weathered, charred, or upended, these miniature structures reverberate with a sense of loss, recording tragedies, transitions, and the passage of time. 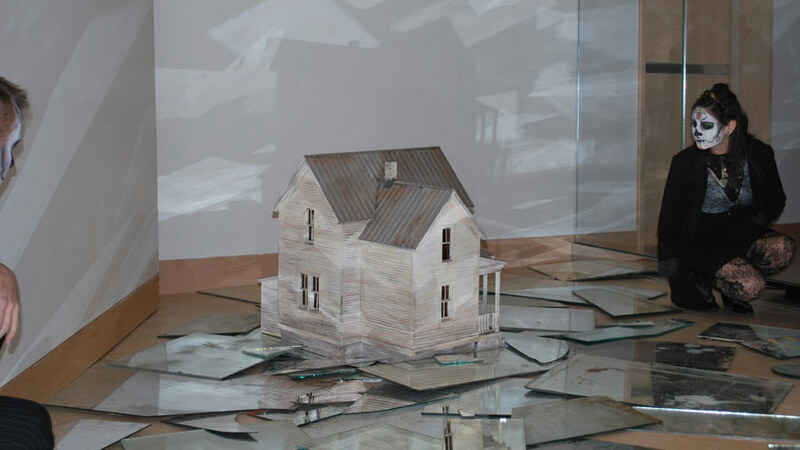 Their work exploits the tension between the notion of a house as an emblem of shelter and security and the reality of its inevitable decay. More broadly, it suggests the impossibility of protection in an unstable world. Shana McCaw and Brent Budsberg are a collaborative team with a twelve-year history working in sculpture, performance, and site-specific installation.